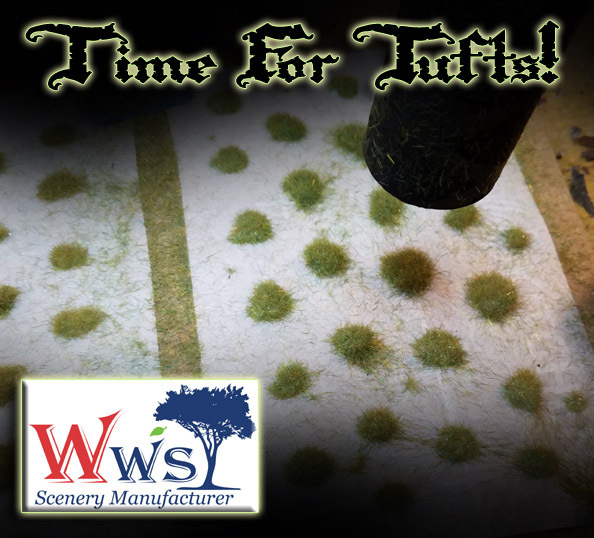 In the last few years, I have been relying more and more on Grass, shrub and flower tufts for my basing, to the degree that I can't purchase new replacements fast enough. Worse yet, the type I am looking for is quite frequently out of stock just when I need it most. 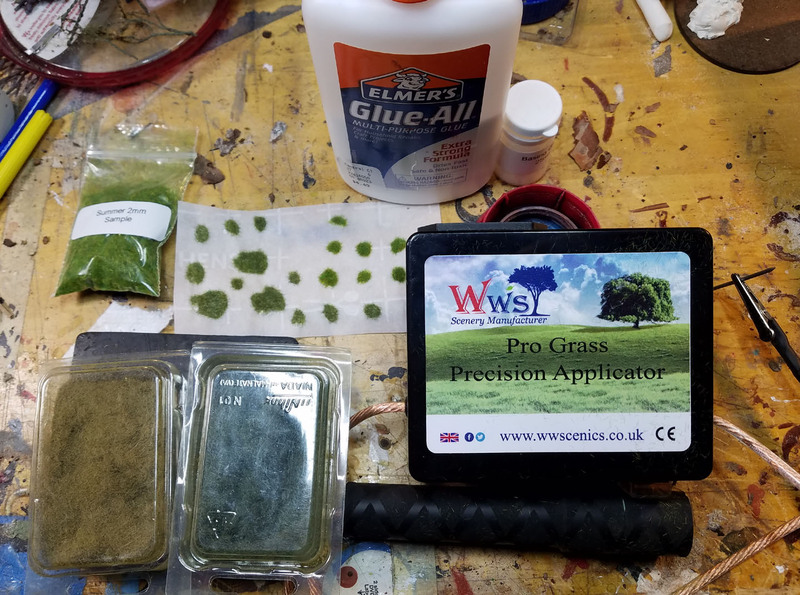 That is why I was quite relieved to see that my first few tests with the Static Grass Applicator from WWS Scenery appeared to have been successful! Ideally, I would like to have the larger applicators, but this "detail" applicator is what I had to work with. 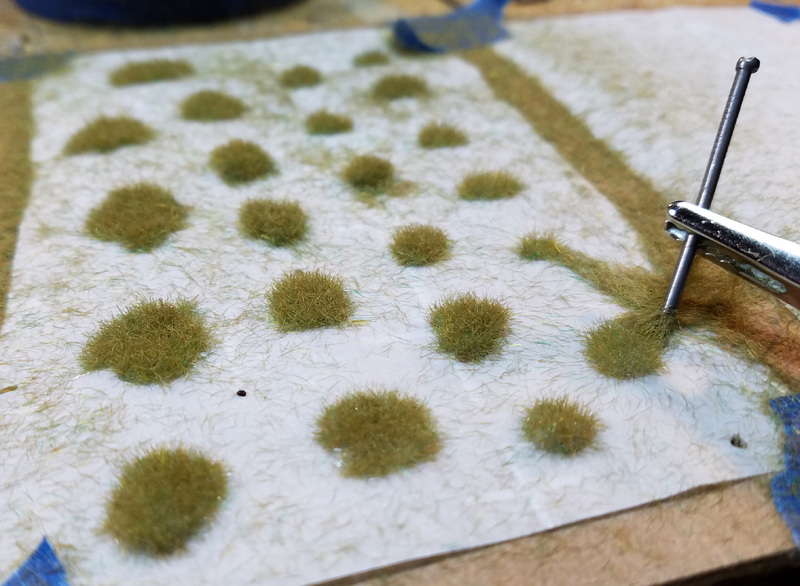 It is intended to put static grass into hard to reach places on train layouts, but also on your bases. 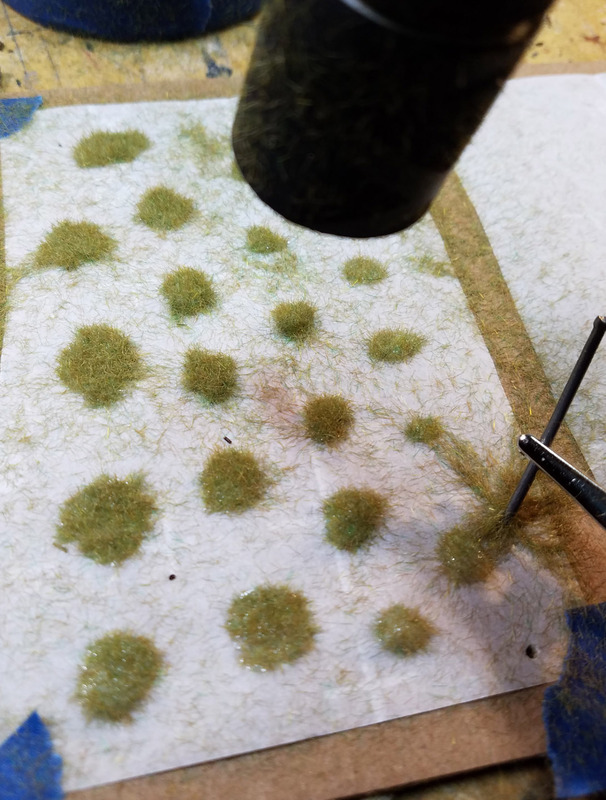 In many different online tutorials, I saw many versions of this tool used to create grass tufts. Better yet, I saw how to create the shrub and flower tufts which are eve more difficult (or expensive!) to procure. It is best to have a mix of grass colors and heights. I think these vary from 2mm to 4mm. 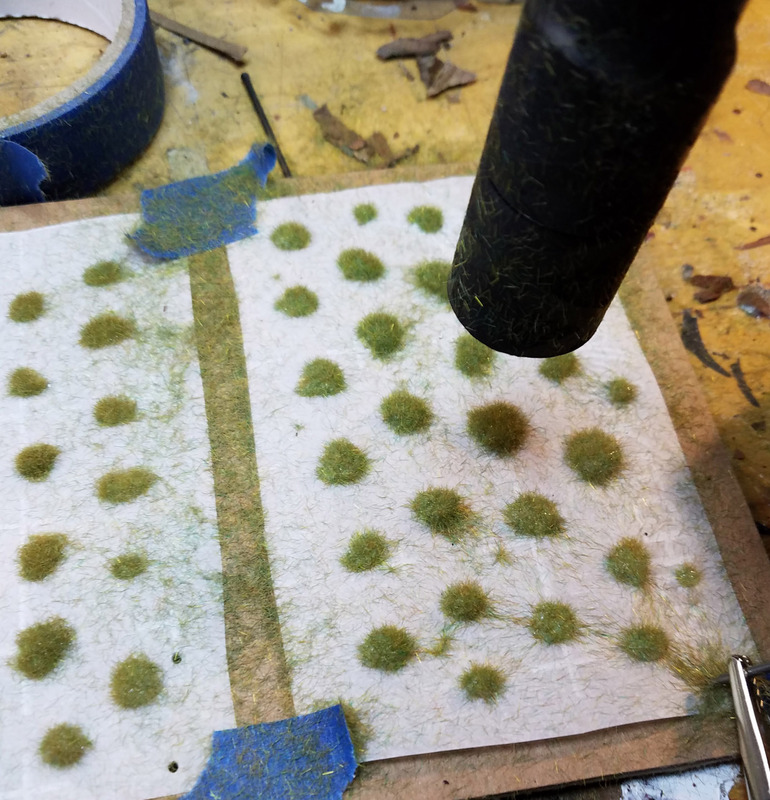 I am trying to get my hands on 6mm, which would make excellent tufts! 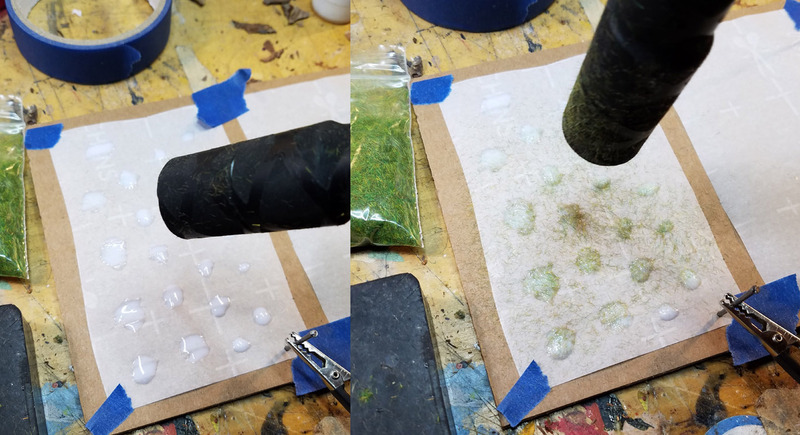 Taping down some basic parchment paper, I used the glue which came with the kit. I will experiment with Elmer's glue and even wood glue next to see what happens. This seemed to release very easily from the parchment paper. I taped them to the cardboard to keep them flat, and give something for the nail to stick into. More on that later! 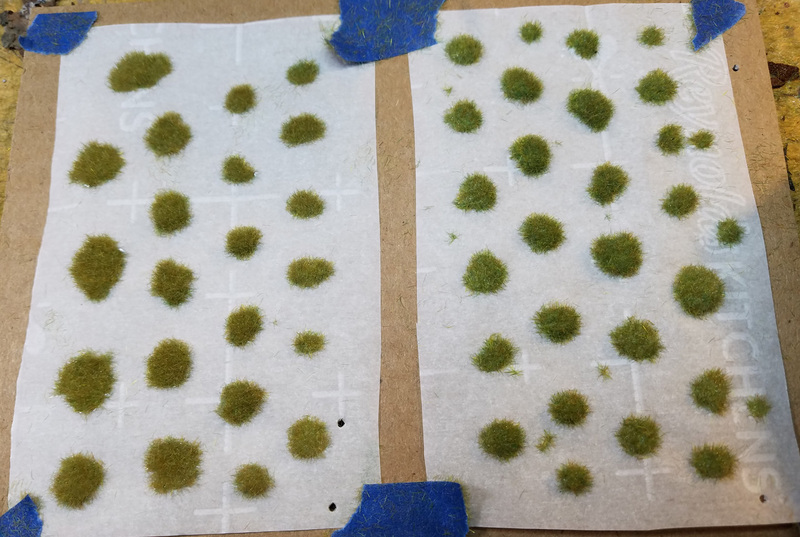 After making a test sheet with the 2mm Summer grass, I mixed in some Woodland Scenics 4mm fall grass. This would create more variation in color and height. That is mixed into the applicator. 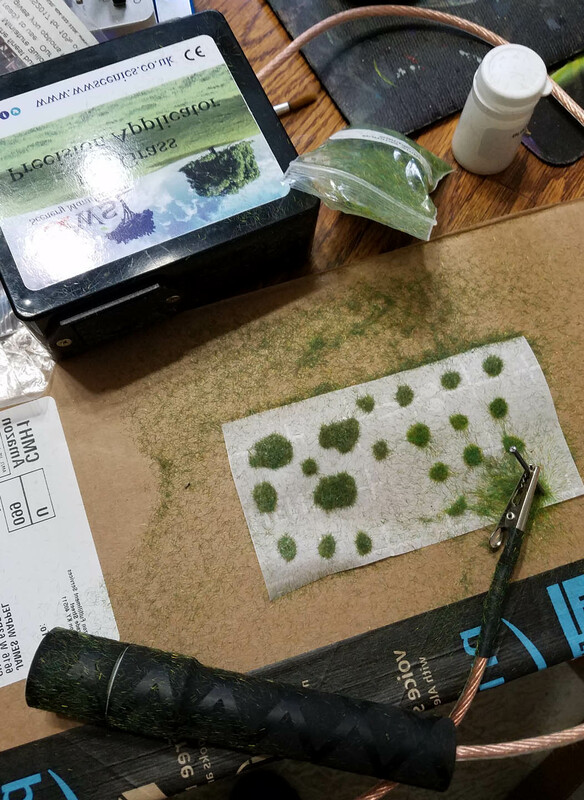 Note that it is only a screen covering the 'cup' so you will want to work on some kind of tray to keep all the scattered grass in a lace where you can get it collected. You clip the grounding wire to the nail, which you can see in the corner. It takes a number of passes for the grass to start falling out, and you have to keep the wand moving to get the grass to stand up. Obviously a larger applicator would make short work of these! You can get a sense of the static generated by the nail. You will want to keep computers and phones clear from this area, as the grass will get 'around'. I was really excited as I started to see these tufts emerge from blobs of glue!!! I tried to apply the glue in a few different ways... flatter and more spread out, and in taller blobs. Both seemed to work out OK. I mixed all three colors and heights together for the final sheet. 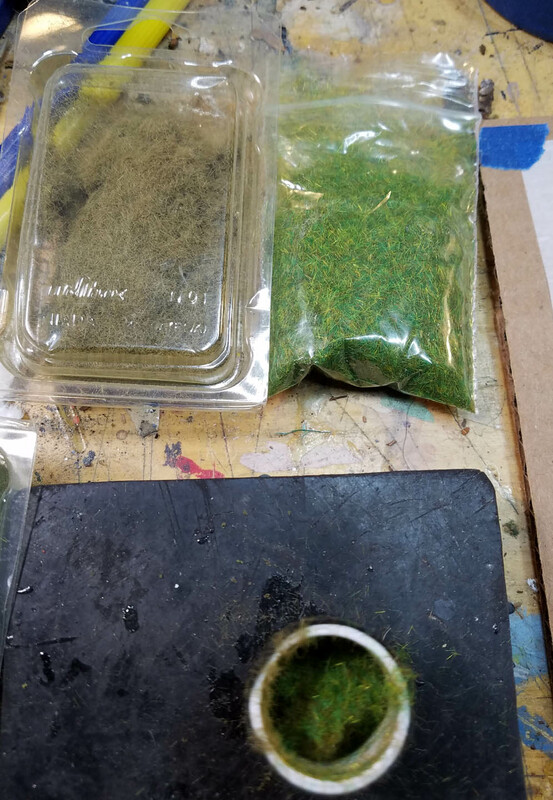 Again, I have some more materials on the way, like taller grass. 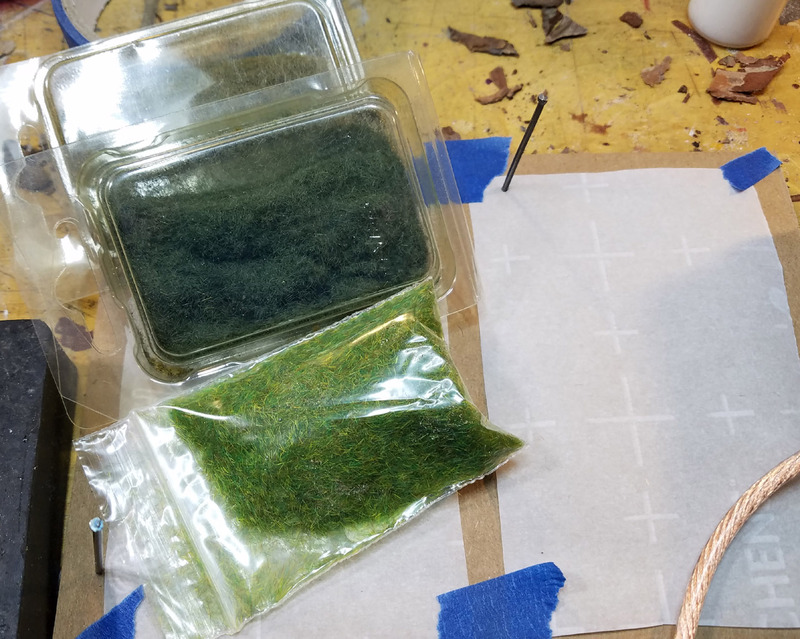 There are also leaves and colored foam which will allow me to add onto these simple grass tufts and turn them into much more! 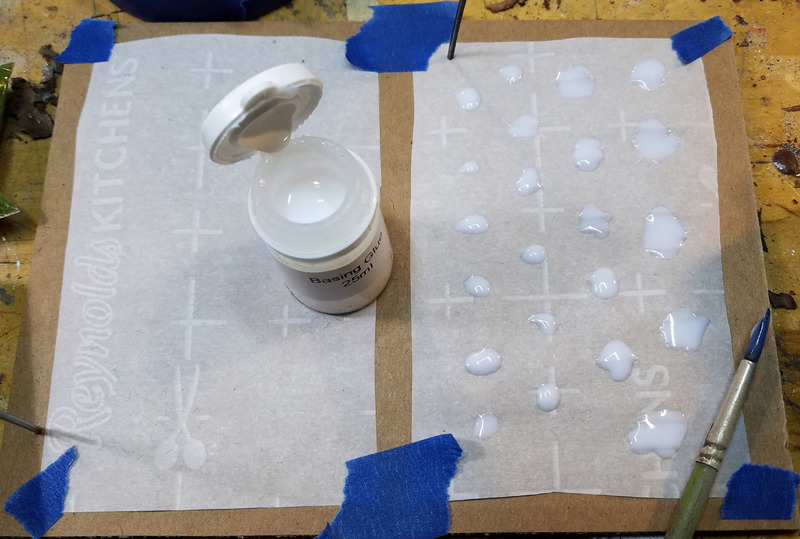 On this sheet, the glue was in taller blobs, and I have to say I liked the results. It helped to make the shorter grass just a wee bit taller. I don't know if you can see the color difference here, but it is actually substantial. 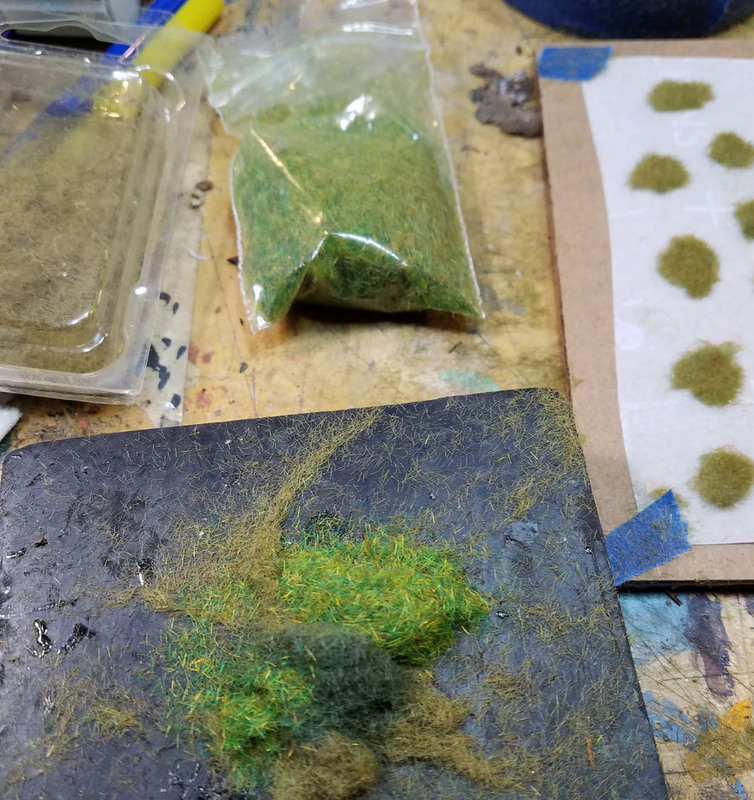 Even if I didn't like the colors, I have discovered that I can airbrush tufts to get them more in line with what I need. One more peek at the tufts! 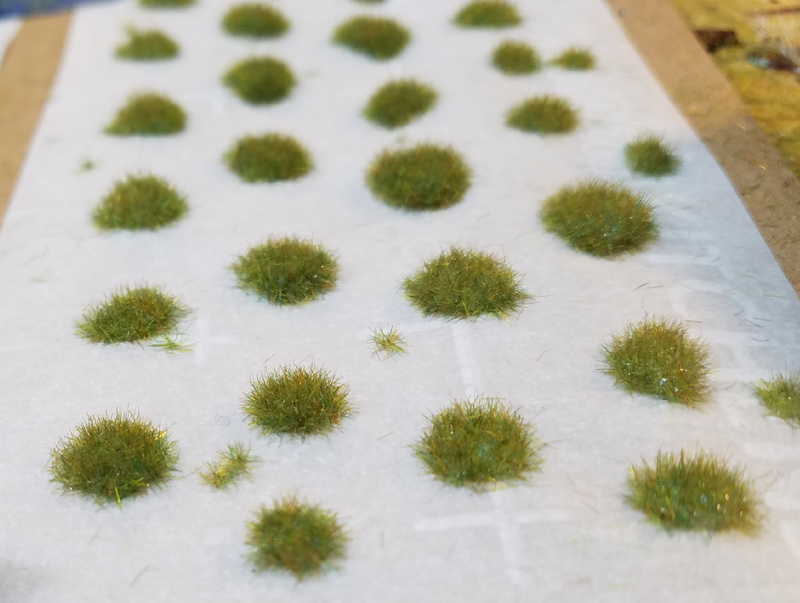 Since I am virtually out of the store bought tufts already, these will be utilized on figures that I am painting right now. I will continue with these experiments, so that I can become proficient enough to make some how to videos for the Patreon Page. I am not sure if the resolution of Facebook Live sessions will adequately show what it takes in this process. Who knows... I may even make tufts part of the pledge rewards. I am already going to do that with my home made bases, so why not? Here's a link to the page, where I will be announcing the new pledge levels very soon!